NovaHaat Khaki Kutch Embroidery Wall Hanging - Vintage Huge Ethnic Indian Tapestry with Ganesha, Lakshmi and Peacock Motifs and Mirror Work ~ 83" x 77"
Khaki Kutch Embroidery Wall Hanging - Vintage Huge Ethnic Indian Tapestry with Ganesha, Lakshmi and Peacock Motifs and Mirror Work ~ 83" x 77" A Mystical Tapestry made of Kutch embroidery patchwork in vibrant colors of rural India! 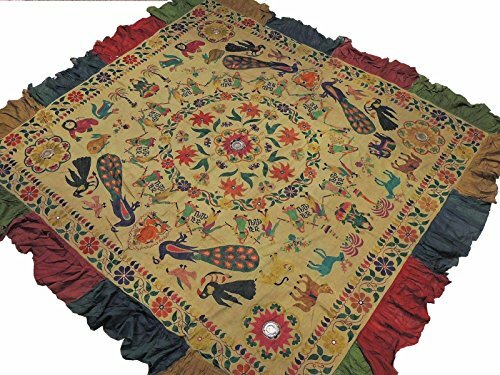 The Kutch style is very specific to western Gujarat, Rajasthan and parts of Sindh in Pakistan.You are looking at a very vibrant & stunning work of folk craftsmanship, one of the most Ethnic pieces you've probably ever seen. The "Banjara" style is one of the most prized styles of hand embroidery, never seen in any departmental store in the U.S and limited to collector's sites. What distinguishes this memorable style of embroidery is the fact that it covers every inch of fabric with exuberant colors of rural western India. This gorgeous & exquisite Tapestry has intricate & heavy "Banjara" hand embroidery embellished with glittering large antique mirrors. So extensive & intricate is the work that the package weight of this tapestry is 4.5 lbs! This masterpiece will glitter & illuminate any wall, table or chest.This spectacular piece of workmanship & skill is an amazing collage of hundreds of intricate antique mirrors, intricate thread work, beads & what not.The sparkling embellishments will lend a spectacularly ethnic look and add style to your room. Transform your wall with the royal grandeur of Indian culture. This unique elegance will add character and transform your table too if you choose to use this as a runner / table cover.Go for a dramatic makeover of your couch and this throw in your living room would become a conversational piece of art. You'll have to just stare at this dramatic piece for hours to believe the unbelievable! A must have in any season for all ethnic savvy ones. This is a rare beauty not to be missed, a genuine collector's item. Vintage textile. May have minor rips, stains, color bleeds or missing mirror work. NovaHaat Straw Yellow Kutch Embroidery Tapestry - Vintage Huge Ethnic Indian Wall Hanging with Ganesha, Lakshmi and Peacock Motifs and Mirror Work ~ 78" x 75"